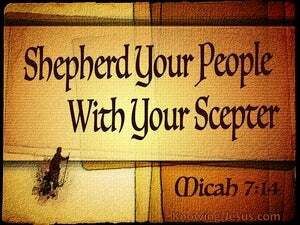 ﻿ Micah 7:14 Shepherd Your people with Your scepter, The flock of Your possession Which dwells by itself in the woodland, In the midst of a fruitful field Let them feed in Bashan and Gilead As in the days of old. Feed thy people with thy rod, the flock of thy heritage, which dwell solitarily in the forest in the midst of Carmel. 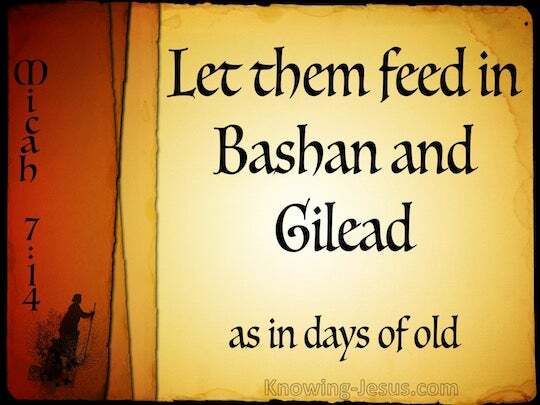 Let them feed in Bashan and Gilead, as in the days of old. Rule and feed Your people with Your rod and scepter, the flock of Your inheritance who dwell alone in a forest in the midst of Carmel [a garden land]; they shall feed in Bashan and Gilead, as in the days of old. Keep your people safe with your rod, the flock of your heritage, living by themselves in the woods in the middle of Carmel: let them get their food in Bashan and Gilead as in the past. Feed thy people with thy rod, the flock of thine heritage, which dwell only in the mountain, in the midst of Carmel; let them feed in Bashan and Gilead, as in the time of old. Feed your people with your staff, the flock of your heritage, who dwell alone in the forest, in the midst of Carmel: let them feed in Bashan and Gilead, as in the days of old. Shepherd your people with your staff, the flock of your inheritance, those dwelling alone [in] a forest in the midst of Carmel. 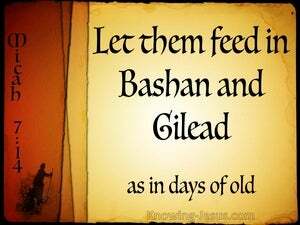 Let them feed in Bashan and Gilead, as [in] the days of old. 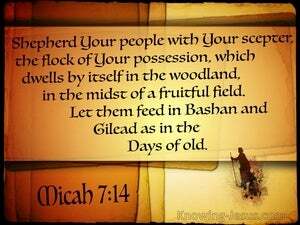 Feed your people with your rod, the flock of your inheritance, who dwell alone in the woods, in the midst of Carmel; let them feed in Bashan and Gilead, as in the days of old. Therefore feed thy people with thy rod; the flock of thine heritage which dwell desolate in the wood: that they may be fed upon the mount of Carmel, Bashan and Gilead as afore time. Shepherd your people with your shepherd's rod, the flock that belongs to you, the one that lives alone in a thicket, in the midst of a pastureland. Allow them to graze in Bashan and Gilead, as they did in the old days. Shepherd your people with your staff, the flock of your heritage, who dwell by themselves in a forest, in the midst of fertile pasture land, let them feed; in Bashan and Gilead, as in the days of old. Shepherd thou thy people with thy rod, the flock of thine inheritance, Dwell thou alone, a jungle in the midst of a fruitful field, - Let them feed in Bashan and in Gilead, as in the days of age-past times. Feed thy people with thy rod, the flock of thy heritage, who dwell solitarily in the wood, in the midst of Carmel: let them feed in Bashan and Gilead, as in the days of old. Rule Thou Thy people with Thy rod, The flock of Thine inheritance, Dwelling alone in a forest in the midst of Carmel, They enjoy Bashan and Gilead as in days of old. 13 And the earth will become desolate because of her inhabitants, On account of the fruit of their deeds. 14 Shepherd Your people with Your scepter, The flock of Your possession Which dwells by itself in the woodland, In the midst of a fruitful field Let them feed in Bashan and Gilead As in the days of old. 15 "As in the days when you came out from the land of Egypt, I will show you miracles." "For how then can it be known that I have found favor in Your sight, I and Your people? Is it not by Your going with us, so that we, I and Your people, may be distinguished from all the other people who are upon the face of the earth?" It will blossom profusely And rejoice with rejoicing and shout of joy The glory of Lebanon will be given to it, The majesty of Carmel and Sharon They will see the glory of the LORD, The majesty of our God. "Through your servants you have reproached the Lord, And you have said, 'With my many chariots I came up to the heights of the mountains, To the remotest parts of Lebanon; And I cut down its tall cedars and its choice cypresses And I will go to its highest peak, its thickest forest. "Sharon will be a pasture land for flocks, And the valley of Achor a resting place for herds, For My people who seek Me. 'And I will bring Israel back to his pasture and he will graze on Carmel and Bashan, and his desire will be satisfied in the hill country of Ephraim and Gilead. "Then the offering of Judah and Jerusalem will be pleasing to the LORD as in the days of old and as in former years.